Lely, a Dutch portrait painter who worked in England, was successful during the Commonwealth (1649–1660), when England was ruled by Parliament and then by the Puritan Oliver Cromwell. However, when rule was returned to the English monarchy during the Restoration (1660–1689), Lely became their Principal Painter. His subject here, Margaret Hughes, was one of the first actresses on the British stage. Prior to the closure of theaters during the Commonwealth, men and boys traditionally played women’s roles. When they reopened during the Restoration, King Charles II decreed that men were no longer allowed to play women’s roles. Hughes was famous for her portrayal of Desdemona and also as the mistress of Prince Rupert, cousin and privy councilor to Charles II. Lely shows Hughes here as an ideal Restoration beauty—oval face, large almond eyes, pale skin, and red lips. 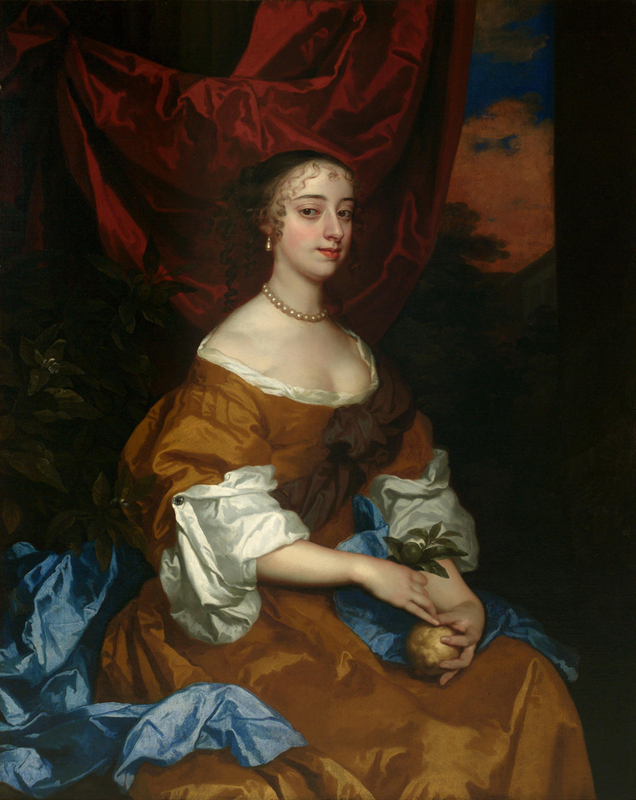 She holds an orange, referring to Rupert’s royal lineage from the Dutch House of Orange. Her luxurious clothes and pearls give further evidence of his favor. Prince Rupert is credited with the invention of the mezzotint. This printmaking method is especially suited to reproducing the textures of rich fabrics and skin and dramatic contrasts of light and dark. Eventually, some of Lely’s portraits of Margaret Hughes were produced as mezzotints.